July 21, 2006, LG Crabo. 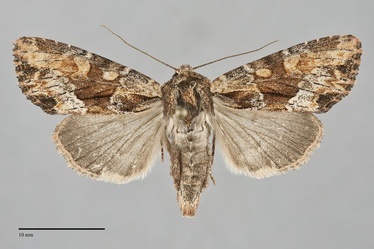 Apamea aurianticolor is a medium-sized moth (FW length 17–21 mm) with mottled orange-brown, ochre-tan, light-gray, and black forewings with light ochre filling in the forewing spots and dusty silver-gray in the posterior subterminal area that flies in the mountains of eastern Idaho during the summer. 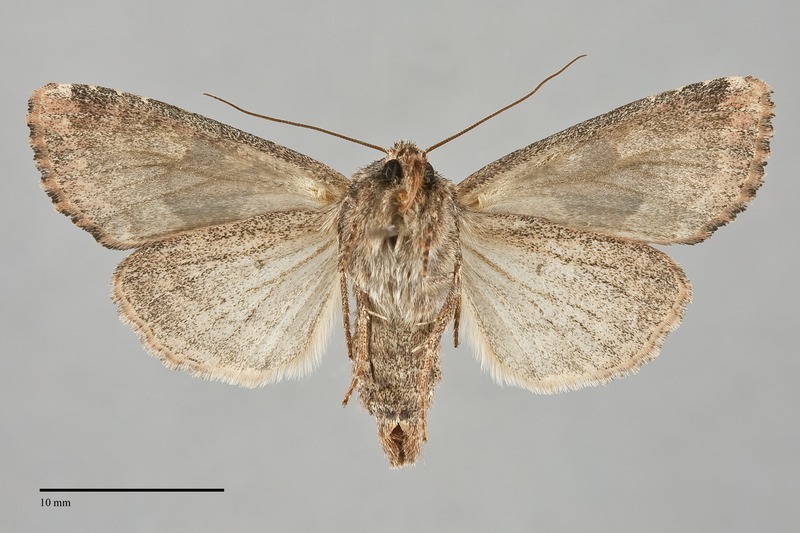 The outer margin of the forewing is lightly scalloped. The ground color is medium-dark warm orange-brown, often mottled with ochre-tan. The ochre color forms a diffuse patch from the reniform spot to the apex in most specimens, and the base anterior to a thin black basal dash is nearly as light. The antemedial and subterminal areas are variably powdery silver-gray, strongest in the posterior subterminal area. The terminal area except the apex is powdery dark gray. A weak median dash is often present, and a black line similar to the basal dash is present above the posterior margin near the base. The veins in the subterminal area are black near the subterminal line or across the width of the area. The basal, antemedial, and postmedial lines are gray, partially double filled with ochre and silver-gray. The basal line is a pair of spots on the costa. The antemedial line is variable in darkness, usually complete but strongest on the posterior wing where it is convex toward the outer margin and incurved on the margin, irregular with teeth toward the base on the veins. The median line is dark and diffuse, weakly present from the costa to the lower cell. The postmedial line is scalloped, weak on the anterior wing where it is usually filled with ochre and curves evenly around the reniform spot, stronger and filled with silver-gray posterior to the cell where it is angled strongly toward the base, narrowing the posterior median area. A short segment in the fold abutting the distal median dash is black and light gray. The subterminal line is ochre, thin, very uneven with a moderate W-mark on M3 and Cu1 that sometimes reaches the margin. It is preceded by a red-brown shade, and variably by two diffuse dark wedges on the mid-wing. The terminal line is dark spots between veins. The fringe is variable, a checkered combination of dark gray, red-brown, and ochre tan. The orbicular and reniform spots are partially outlined in red-brown or gray and filled mostly with light ochre. The orbicular spot is oval, often with a weak central ocellus. The reniform spot is kidney-shaped, weakly outlined on the lateral side, with red-brown to gray inferiorly, and sometimes with a faint lunule along the medial side. The claviform spot is gray but occasionally absent, moderate-sized. The hindwing is gray-tan with extensive medium-gray suffusion, with slightly darker veins, discal spot, postmedian line, and terminal line. The hindwing fringe is pale tan with a pink tint. The head and thorax are gray-brown to dark with darker brown lines near the edges of the collar and tegulae. The male antenna is bead-like. This species can usually be recognized in its limited Pacific Northwest range by its mottled warm orange-brown, ochre, silver-gray, and dark gray forewing with black dashes, ochre-filled spots, and silver-gray patch in the posterior subterminal area. It is closely similar to Apamea sora and Apamea tahoeensis, but none of these three species occur together and can therefore be separated by distribution alone. The distributions of A. aurianticolor and Apamea sora approach each other in western Montana and central Idaho. Specimens from these areas would be difficult to distinguish from each other without resorting to advanced techniques such as DNA sequencing or dissection as discussed by Mikkola et al. (2009). Apamea aurianticolor is most likely to be confused with the slightly larger species Apamea antennata. This species is more uniform orange-brown without ochre mottling and has more extensive violet-gray shading across its posterior wing. It also has red-tint on both sides of the hindwing that A. aurianticolor lacks. This species flies in dry, open ponderosa pine forests at middle elevations, and mixed spruce-fir or quaking aspen forests at higher elevations. It is usually common in the proper habitat. Apamea aurianticolor has only been found in the mountains of east-central and southeastern Idaho in the Northwest. 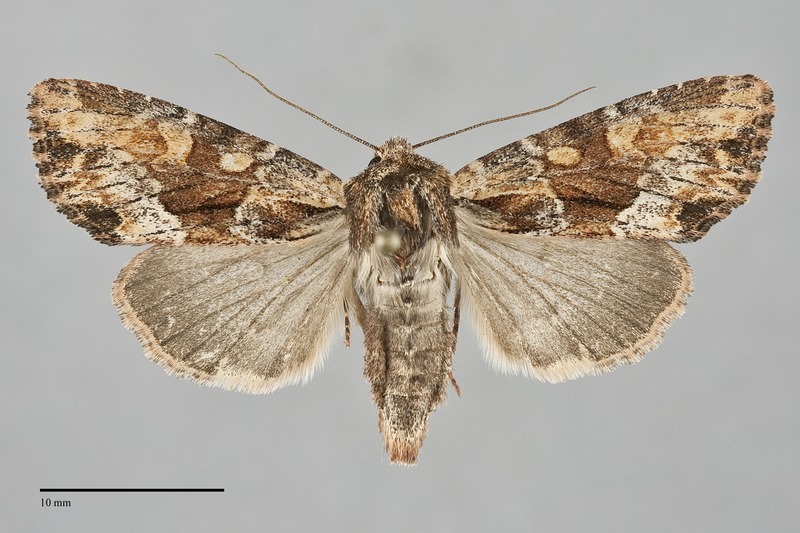 This species flies in the Rocky Mountains from west-central Montana to northern New Mexico. The range extends west to eastern Nevada through Utah. The larva of this species is unknown, but it probably feeds on the roots of grasses (Poaceae) like those of other members of the genus. The flight season of A. aurianticolor is summer, with records from June to August. It is nocturnal and comes to lights.